In Alaska, one in three salmon harvested in commercial fisheries typically are now of hatchery origin. 99 percent of all hatchery salmon in Alaska are harvested in commercial fisheries. Hatcheries have become an integral part of commercial fishing in Alaska, ever since large scale hatchery salmon production hit its stride in Alaska in the 1990s. 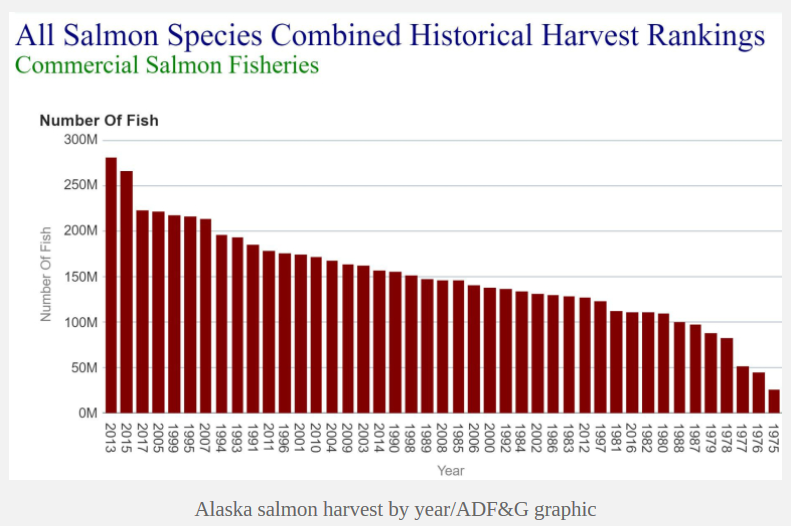 Of the 11 lowest commercial salmon fishing harvests since 1975, only one has occurred after 1990, that year being 2016. Of the 11 highest commercial fishing harvests since 1975, all have occurred after 1990. An interesting pattern of commercial salmon harvest in Alaska has emerged since the introduction of large scale hatchery salmon production, which is primarily located in Prince William Sound and Southeast Alaska. The mix of years in the 11 lowest salmon harvests is split consistently between even and odd years – 6 even, 5 odd. (see ADFG graph below). The mix of years in the 11 highest salmon harvests is not split as randomly, with 10 odd years, and only 1 even year (1994). Pink salmon follow an even year – odd year cycle of larger / smaller returns. In the Gulf of Alaska, pink salmon have an odd year dominant return, and an even year inferior return. 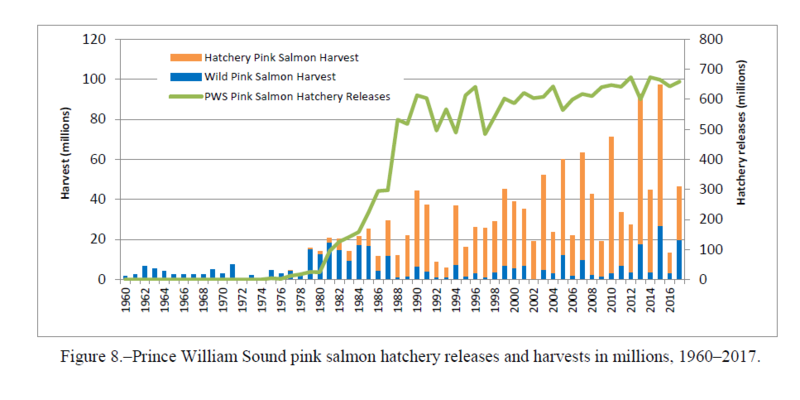 Even though hatchery pink salmon are released in roughly equivalent numbers in Prince William Sound annually since the 1990s (between 500 and 700 million hatchery releases), the odd year dominant / even year inferior pattern continues for pink salmon returns and harvests. 1990 marked the first year that the combination of PWS wild and hatchery pink salmon harvest exceeded 40 million fish. 2013 and 2015 marked the first years that these harvests surpassed 80 million fish. 2015 was the first year PWS wild pink salmon harvest exceeded 20 million fish, and 2013 and 2017 also approached 20 million wild pink harvest. Overall, in 9 of the last 15 years the PWS wild and hatchery pink salmon harvest has exceeded 40 million fish.